Marche d'Aligre; breakfast croissants; tons of artisanal cheeses. 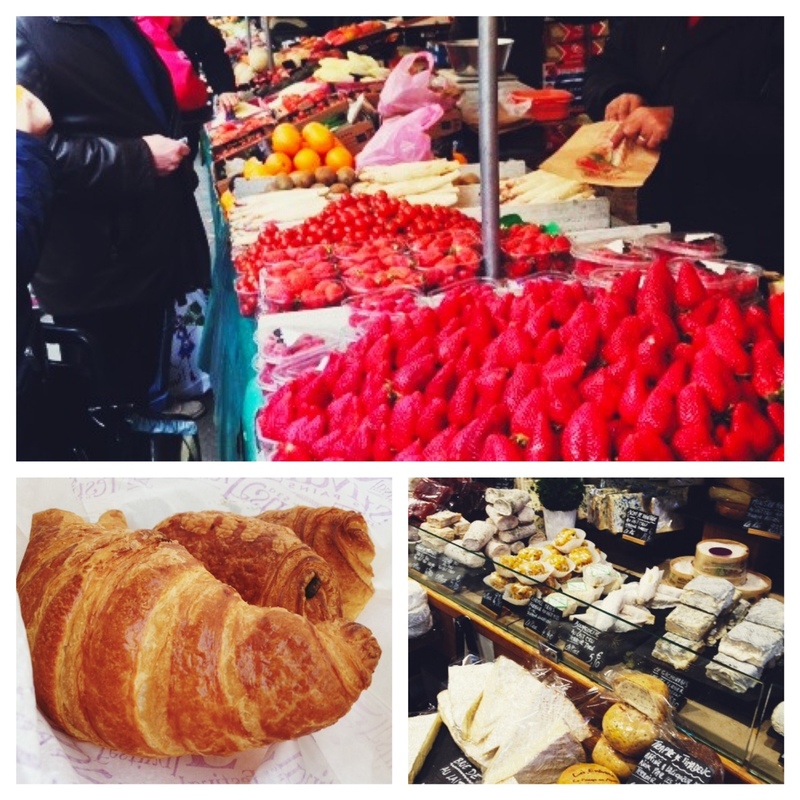 It started out with a train trip over to the Bastille area, where we ate the best croissants out of a wax paper bag as we walked over to the Canal St. Martin. Then we hopped another train to what I heard was one of the best outdoor produce markets, Marche d'Aligre, and picked up our lunch for the day: a fresh baguette, some grapes and tomatoes and three artisanal cheeses (and some carpaccio for the hubs). Our lunch from the outdoor market. Then we stopped at a cafe to use the wifi because we forgot to write down the number of a place I wanted to visit, so while we were there, we felt like heels not ordering anything, so we got some bruschetta. After that, we walked to La Chocolaterie de Jacques Genin for some handmade caramels and chocolates (the caramels are unlike any I've every tasted), then took the train up to Montmartre for a little shopping, including the cutest kids' book store I've ever seen and a vintage store called By Flowers, where I found a really beautiful '50s dress. We were fairly tired after all this walking around, so we finally called it a day and went back to the hotel, then grabbed a quick dinner at Maoz, a falafel chain that's in the U.S. and some places over here, but it was very, very good...and it introduced me to the wonders of dipping your fries in ketchup and mayo at the same time...yum. 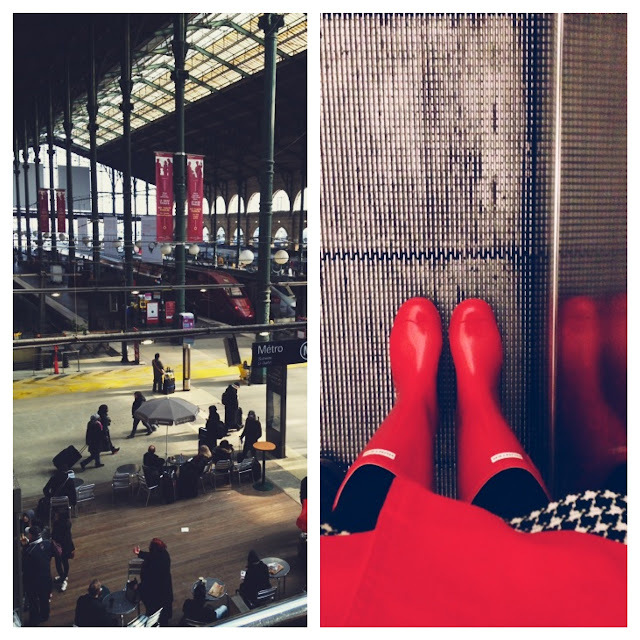 Gare du Nord in Paris as we wait in line at border patrol; me finally wearing my Hunter boots! Sunday was just a traveling day, hopping the Eurostar over to London, checking in at our really cute hotel in Islington, and then eating some really simple and authentic Italian food at a local pub while the hubs got to finally watch a soccer match on TV. And then yesterday we rented a car and drove down to Portsmouth, where our good friend Claire lives. She's been here for 7 months so far doing grad school, and was kind enough to show us around town all day yesterday, starting with lunch at Pie & Vinyl, which has probably been my favorite food I've had on the trip thus far (sorry, Paris). The cafe itself is decorated with a really eclectic but homey vibe, and in the back are cases of records from which you can shop. Claire said they sometimes even have live performances there. 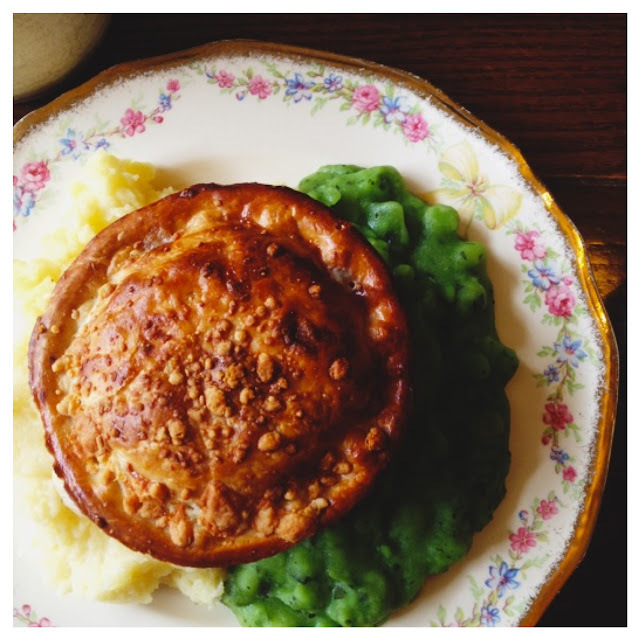 The "Big Cheese" pie with peas and mash at Pie & Vinyl. Then we walked around a while, peeking into some local shops, antique stores, a bookstore and a charity shop (as they call thrift stores here). After that we ducked into this super cute cafe (the name of which I can't remember!) that was decorated with the most amazing vintage and antique furniture. In the middle was a case of mouth-watering desserts that we happily dined upon; I got the chocolate hazelnut cake with passionfruit, which was divine. 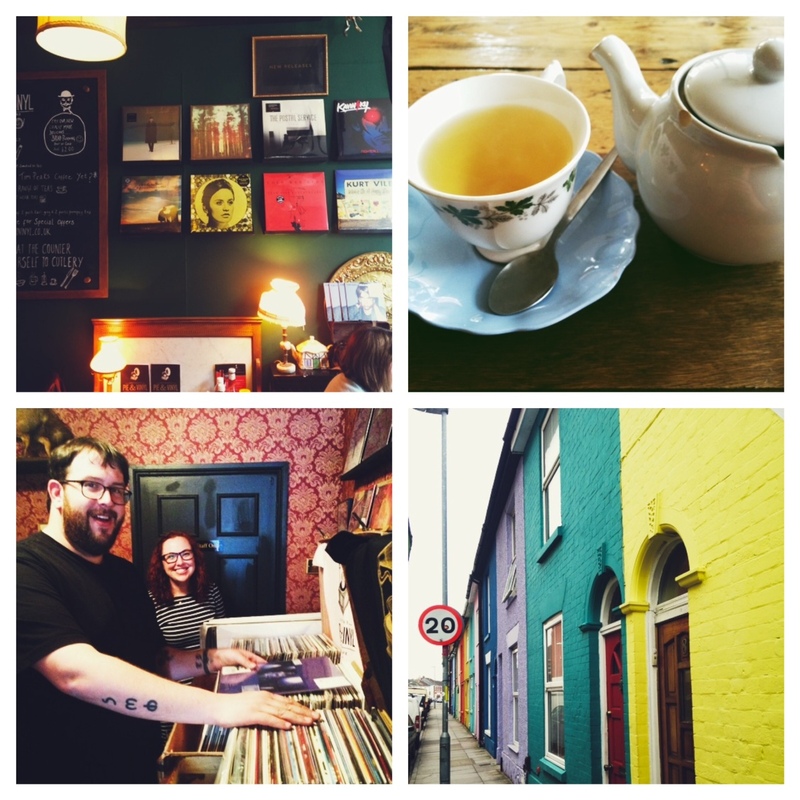 Pie & Vinyl (left column), tea at that cute cafe, and a row of Pantone house fronts! Once we were properly pumped full of sweets, we went on a long walk all around town and saw some beautiful seaside views atop old towers, as well as the area where Charles Dickens was born, an amazing church that was built in 1212 and just loads of historical things. Today we're headed back to the docks to take a look at the warships before we jet off to Bath, so I'll be suer and snap some more shots of all that! Until then!